The fall and winter seasons are my favorite times of the year. I love the change of the temperatures, the holidays, the vacations and all those warm-fuzzies that come along with this time of year. While it’s ridiculously hot in my neck of the woods (Tampa, FL), I’m excited for a few cold-fronts that will be headed our way this week, AND extremely looking forward to our trip to the mountains of North Georgia in T-20 days. Even though temperatures are unseasonably warm, nothing is stopping me from lowering the a/c, throwing on some cozy pajamas, and whipping up slow cooker comforting soups like this. Hey, fake it til’ you make it! This creamy butternut squash soup is delicious on it’s own, but I’ve topped it with, wait for it, grilled cheese croutons! You’re welcome. In addition, this soup is gluten-free (you can easily make the croutons GF with some Udi’s GF bread), and vegetarian! Prep: Prior to cooking, wash and diced (into large chunks) the potatoes and carrots. Peel and chop the onion into smaller chunks, peel and mince the garlic and peel and remove the seeds and cut the butternut squash into chunks the same size as the potatoes. You can also use pre-diced butternut squash (Trader Joe's). Make sure you have all of your spices out, and that your slow-cooker is out, plugged in and uncovered so that you can easily throw all of your ingredients in. Leave your cream in the fridge. You won't need it until the end. Set your slow cooker to high. Add in potatoes, carrots, squash, onion, garlic, spices and vegetable broth. Stir well. Cover and cook on high for 4-5 hours. You want all of the vegetables to be soft. Turn off the slow cooker and let the soup cool a bit. Using an immersion (stick) blender, blend until smooth. If you don't have a stick blender, cool the soup COMPLETELY, then place into a regular blender in small batches. Do not put hot soup in a blender! It will explode everywhere and you could get hurt! Return to the slow cooker and heat to serve, or heat in small servings as needed. Prior to serving, stir in the cream, add a bit more salt and pepper (to taste), then top with a sprinkle of extra smoked paprika. For the croutons: Preheat a frying pan to medium high heat ,and an oven to 350. Make a traditional grilled cheese. Let cool a bit, then cut into 1in x 1in squares. Place on a baking sheet and bake at 350 for 10 minutes. Float on the top of your soup and enjoy! 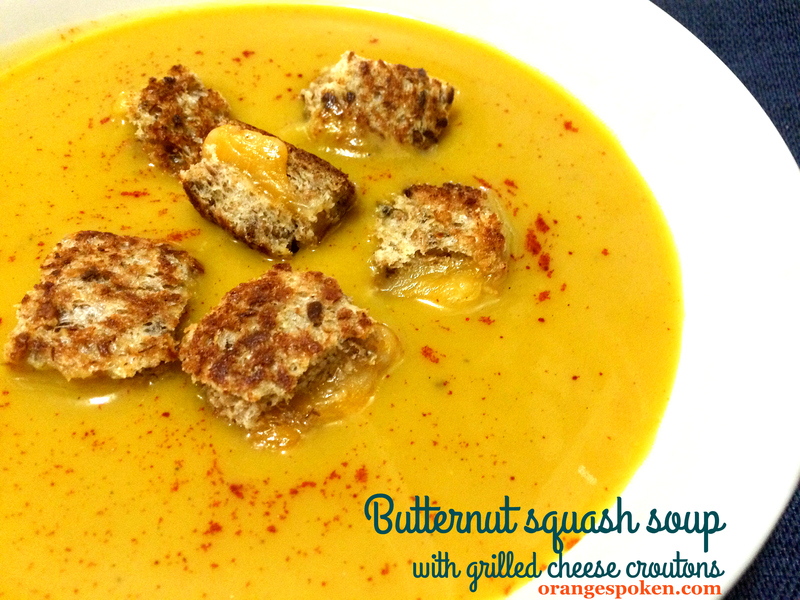 This entry was posted in Recipes and tagged grilled cheese croutons recipe, slow cooker butternut squash soup. Bookmark the permalink. On my “to make” list now! How ingenious to use grilled cheese croutons! Love it!